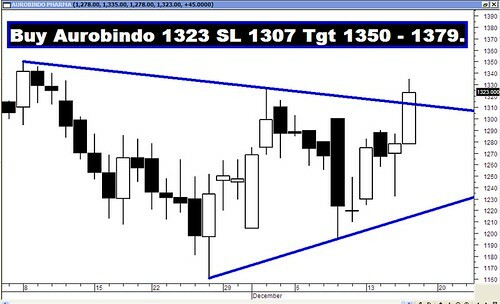 Archives : BULLISH HARAMI REVERSAL -16/12/2010. BULLISH HARAMI REVERSAL - 16/12/2010. 50DMA - MEDIUM TERM TREND DECIDER. It was a tough week for the traders as the market struggled in the beginning of the week but managed a strong close, just above the congestion zone of 5930-5940. In a way, the close above 5934 which was 61.8% retracement of the short term rise indicates the markets intention to test the previous intermediate high i.e. 6069. Nifty managed to hold on to the critical support at 5800 and sustained buying at lower levels pushed the indices upwards. The RBI kept the key interest rates Repo, Reverse Repo and CRR unchanged which lifted the sentiment of the beaten down banking stocks and this led to a short covering rally. The Nifty managed a close above the 20dma and as a result the short term trend has reversed. Now the test for the market will be at 50dma (Sensex – 20064 and Nifty – 6033), which will determine the medium term trend. The Sensex opened the week at 19600, made a high of 19897, a low of 19321 and closed the week at 19864. The Sensex gained 356 points on a weekly basis. Similarly Nifty opened the week at 5882, made a high of 5956, a low of 5795 and closed the week at 5948. The Nifty too closed with a gain of 91 points on a weekly basis. Both Sensex and Nifty have formed a bullish reversal pattern called Bullish Harami on the weekly charts. A confirmation, if required, can be had in the next week in the form of a white candle. On the daily charts, a white body candle is formed with a comparatively long lower shadow. This indicates buying support at lower levels. The market has just managed a close above the 20dma (Sensex – 19662 and Nifty – 5904) and as a result the short term trend has turned positive. The market is below the 50dma (Sensex – 20064 and Nifty – 6033) and hence the medium term trend continues to be down. At the same time both the indices are still above their 200dma (Sensex – 18422 and Nifty – 5530) and hence the long term trend still continues to remain positive. Both the indices have recently formed a bottom at Sensex 18954 and Nifty 5690. This bottom was tested after a week when the indices went lower (Sensex 19074 and Nifty 5721) without breaching it. Hence in the short term Sensex 18954 and Nifty 5690 assumes lot of significance. The long term trend will remain intact as long as Sensex 17819 and Nifty 5348 remains intact. In the current upmove an upward gap was left behind on the Sensex i.e. between 18845-18823 and now this gap is likely to act as a support. One can expect some support coming in at this level. Both Sensex and Nifty are correcting the entire fall from 21108 to 18954 and Nifty 6338 to 5690 and the relevant correction levels for the Sensex will be 19777-20031-20285 and for the Nifty 5938-6014-6090. Only a close above the 61.8% retracement level (Sensex 20285 and Nifty 6090) will signal a resumption of the uptrend and a possible move towards the testing of previous high (Sensex 21108 and Nifty 6338). In the short term both Sensex and Nifty have formed a Flag formation and a breakout is in place and the immediate target will be at Sensex 20316-20598 and Nifty 6087-6185. From slightly long term perspective, both the indices have formed a Bearish Broadening Top formation and the target for that pattern falls at Sensex 18427 and Nifty 5512. Majority of the oscillators have turned positive. MACD, ROC and RSI have managed to give a Buy signal. The Stochastic oscillator is moving higher and as a result the fast stochastic has reached overbought territory. The Directional Indicators are in Sell mode as -DI continues to be above +DI. MFI which is at 65 has given a Buy signal which indicates money flowing into the security. OBV is moving higher but is yet to signal a Buy. The OI PCR is has improved and is currently at 1.28. Highest Open Interest build up is seen at 6000 Call and 5800 Put for the Dec series. Put writing at 5800 levels suggests strong support at that level and 6000 levels will provide strong resistance. The Trendline Resistance for the Sensex falls at 20105 and for the Nifty 6016. The Trendline Support for the Sensex is at 19142 and for the Nifty 5772. For the week ahead, Sensex will find Support at 19613-19342-19074 and will find Resistance at 20084-20267-20452. For the week ahead, Nifty will find Support at 5894-5824-5772 and will find Resistance at 6016-6084-6151.